If you're trying to stick to a whole-food or plant-based diet, this is the perfect high-carb meal for you. Root vegetables like beets, carrots, and potatoes are full of vitamins and minerals you don't find in breads, pastas, and other refined carbohydrates. 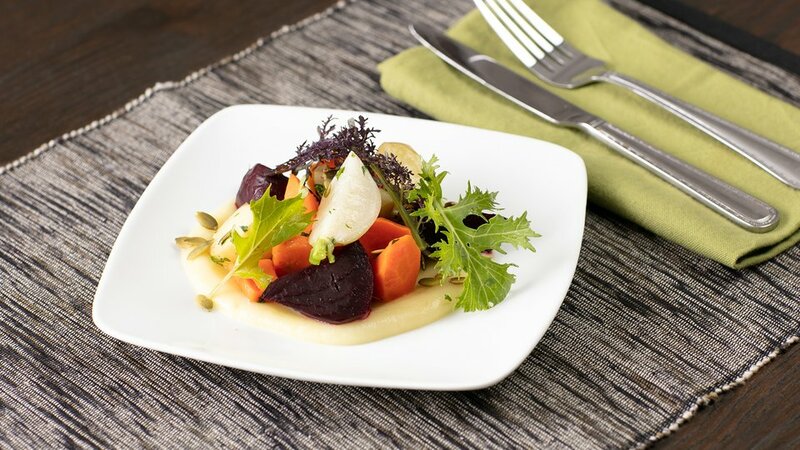 Enjoy these root veggies with the fresh parsnip puree, or mix things up by using your favorite dressing or marinade instead. You can enjoy this vegetarian meal on its own, or pair with grilled steak or baked chicken for a savory and satisfying meal. Bring a pot of water to a boil and lightly salt. Cook the beets, carrots, and potatoes in salted water until slightly tender, about 20 minutes. Let cool. Combine the parsnip, lime juice, honey, and olive oil in a food processor or blender, and mix until very smooth. Toss the cooked vegetables and chives with the parsnip puree. Top with pumpkin seeds and serve.